It is situated at an altitude of about 11,800 ft. And is 149 Kms. from Gangtok. It is covered with rhododendronshrubs and trees of various species. The valley is well known for its hot springs, which is slightly saline in taste, it is colorless, emits bubbles of sulphurated hydrogen gas and the temperature of 106 degree. It is surrounded by mountains and seems to touch the heaven as one has to face vertically upwards to see the mountain top. The scenic view is breathtaking. Kashmir has several mountain ranges like Pir Panjal, Great Himalaya, Zanskar, Ladakh and the ranges of Karakoram, each with a number of snow peaks. 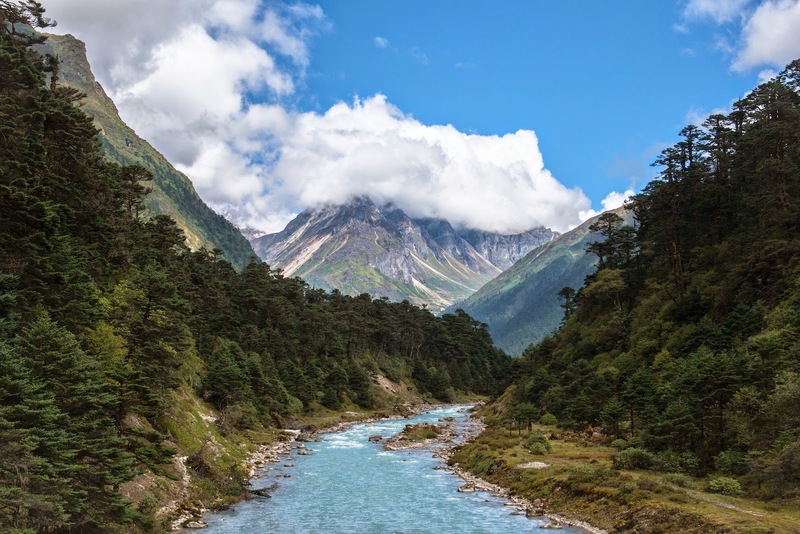 Among these, Ladakh also known as 'Little Tibet' has high and arid landscape with lush irrigated valleys surrounded by beautiful snow capped peaks. Eventhough, Ladakh has a barren land, one can find many scenic locations and vast meadows adorned with multicolored flowers. 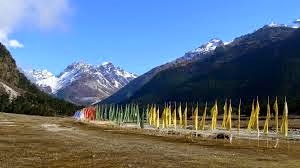 Experience of trekking in Ladakh can be memorable and cherished for a lifetime and, Stok Kangri, the highest peak in the Stok range of mountains is the highest trekking peak in India. The characteristic feature of this beautiful area is magnificent rock formations pointing skyward in orange, purplish and green colors which are formed from strongly furrowed layers of deposits. At the summit one can get the majestic view of the Saser Kangri in the Karakoram Range, Kang Yatse and Nun Kun. Stands at an altitude of 6,153 m above sea level, it is situated within the well known Hemis National Park. 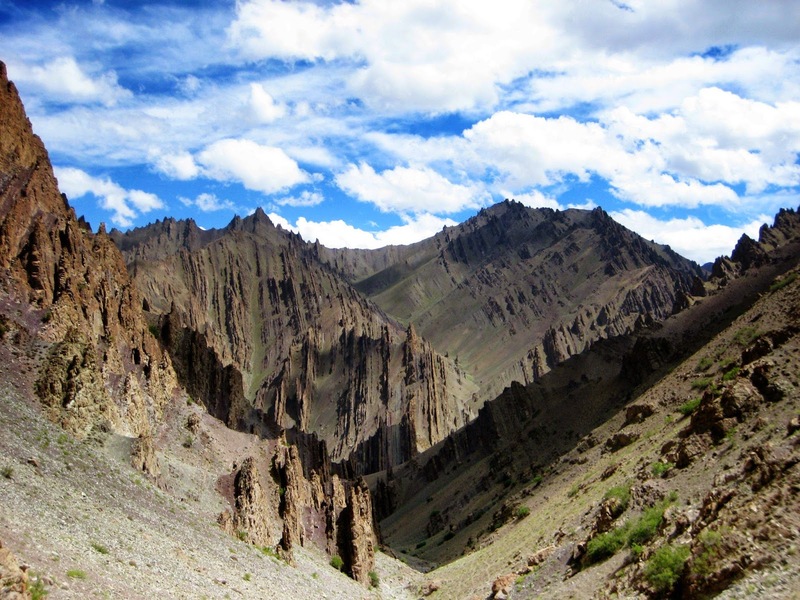 The Stok Kangri, and the Stok valley serves as the gateway to several high altitude trekking trails in Himalayas. start in earnest. Every year thousands of people come here from all over the world to endeavor this amazing trek to the summit. One of the most photogenic waterfalls in India, Nohkalikai in Meghalaya is the fifth highest waterfall in India. 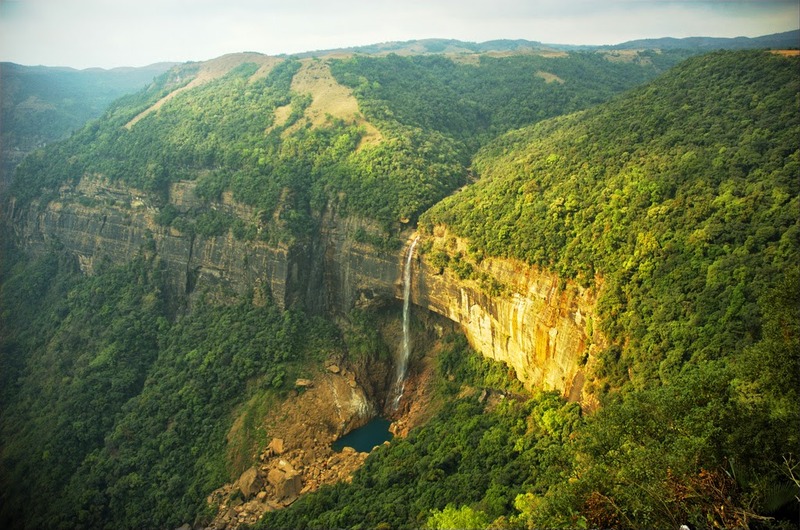 Nohkalikai, which means means ‘Ka Likai’s Leap’ in Khasi language, is located about seven km away from Cherrapunji, the second wettest place on the planet. Water plunges from a height of 1,100 ft uninterrupted from the highest point to the foot of the falls making it a spectacular site. Nohkalikai Falls have been named so after a tragic Khasi legend. According to the legend, a woman named Likai had to remarry after her husband, who was a porter by profession, died on a trip carrying iron to Sylhet. Ka Likai (Ka is the prefix given for the female gender in Khasi) was left with her infant girl with no means of income so she had to become a porter herself. Her work required her to leave her daughter unattended for long intervals but when she would be at home she would spend most of her time taking care of her infant. Ka Likai, who married a second time, couldn’t pay attention to her second husband. The jealous husband killed the infant and cooked her meat after throwing away her head and bones. When Ka Likai returned home, she saw nobody in the house but a meal was ready. She wanted to go look for her daughter but she ate the meat as she was tired from work. Ka Likai usually had a betel leaf after her meals but she found a severed finger near the place where she usually cut betel nuts and betel leaves. Ka Likai realized what had happened in her absence and went mad with anger and started running as she swung a hatchet in her hand. She ran off the edge of the plateau and the waterfall where she jumped from was named Nohkalikai Falls after her. ‘Noh’ means to jump in Khasi. 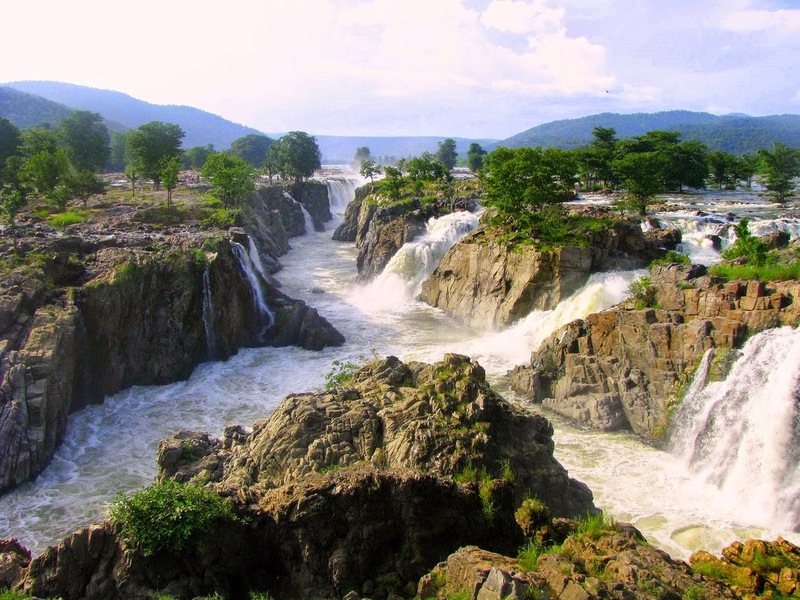 Known as the Niagara of India; Hogenakkal Falls on the Kaveri River (also known as Cauvery) in Dharampuri district of Tamil Nadu. The Carbonatite rocks found near the waterfall are one of the oldest in the world. The name of the waterfall has been derived from two Kannada words – ‘hoge’ meaning smoke and ‘kal’ meaning rock because the mist created by water hitting the rocks creates a feeling of smoke emanating from the rocks. It is also called as Marikottayam by the locals. The water drops from an elevation of about 65 ft at its highest point and from 15 ft at its lowest point. The waterfalls cannot be reached via road; a boat-ride from the last motorable point takes you near the waterfall. Coracles can be hired to get closer to the waterfall. Boatmen row the coracles into the gorge as there is no place from where you can have a good wide view of Hogenakkal Falls. Boating is allowed only after the monsoon has passed because the current in the water is negligible during the dry season and it doesn’t disrupt boating. The river near the falls is a good place to try your swimming skills as the water has some current here. 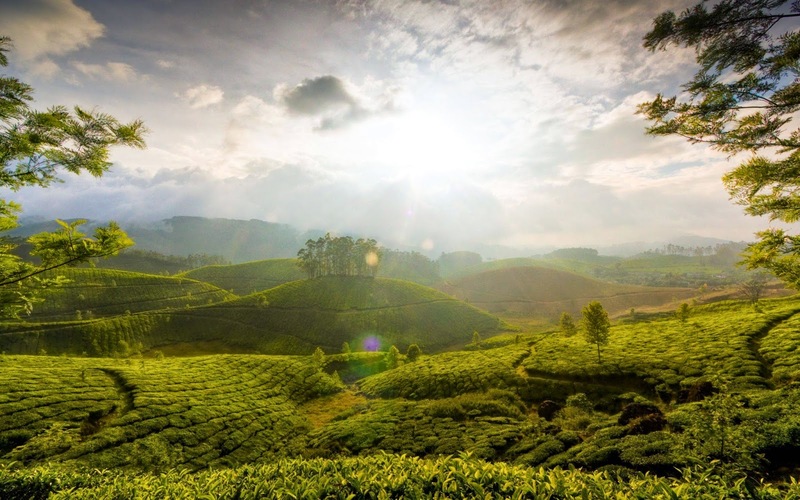 The hills near the falls have many trails where adventure seekers can go trekking in the Melagiri Hills. You can relax while getting a massage from the Hogenakkal masseurs who have an array of oils and powders to rejuvenate your body.